Orders ship 3-4 weeks after art approval. Add approximately a week for art work and proofing. All first time orders incur a $50 setup screen charge (in addition to art if required). Artwork is an additional cost if your art is not camera ready or needs prep. We can help you with this! 50 bags of the same style. NOTE: New orders require $48 screen setup. Repeat orders $30 screen setup. Screen charges 1/2 price on 150-999 bag order and free on 1,000 or more bag orders! Screen costs based on camera ready or digital art work ready to print. Art prep is available at a one time fee, which is quoted per order but generally is $75 or less for nominal prep work. Standard ink colors: Black, White, Process Blue, Reflex Blue, PMS 123 Yellow Gold, PMS 165 Orange, PMS 185 Red, PMS 200 Dark Red, PMS 259 Violet, PMS 282 Light Blue, PMS 320 Aqua, PMS 354 Green, PMS 357 Forest green, PMS 422 Gray and PMS 483 Brown. Custom PMS Colors: Available for $60 up charge. 2 ink color printing is available for approximately 30% up-charge. 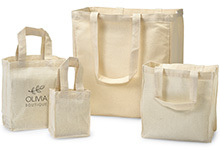 For high-volume orders, printed reusable bags are also available in almost any style or combination of colors. 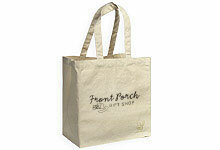 We can add zippers and pouches or custom design a tote to fit your products. Made to order minimums are around 20,000 units and take approximately 4-5 months lead time (on initial orders). 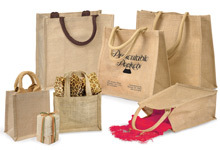 Bags are imported and are approximately the same price as stock bags in these quantities. Orders for full containers will of course be priced accordingly and competitively. For more information, call us at 1-800-547-9727 or email us today!